A portable sawmill isn't the first thing most people think of when considering survival tools, but my Norwood LumberMate Pro MX34 portable sawmill has provided good income, plenty of exercise, a way to meet neighbors and introduced us to some good friends. The goal for purchasing our first mill was to have a means of converting some of our native oak into building material. It seems like i'm always needing sheds, trailer flooring, tomato stakes, or material for various woodworking projects. It only took a few posters at the local farm supply stores to start a fairly steady stream of customers for my custom-cut lumber. It seems other people share my dislike for paying lumber yard prices for twisted pine two-by-fours. Although it is usually a cash business, I have cut some lumber on shares and traded for garden products - even honey. After twelve years of running portable sawmills, I still find it hard to imagine more enjoyable "work". A little background...I live on a corner of our family's tree farm in the southwest Missouri Ozarks. Becky and I moved here shortly after we were married. I cut the logs for our passive solar post and beam home and hauled them to a local sawmill, where they cut them to my specifications. Then I'd bring the posts, beams and boards back, put them in place and try to figure out what I needed next. This went on over the course of four years. With two young children, we were anxious to move in and made the classic mistake of doing so before the house was finished. Although the house remains unfinished after thirty-one years, it has sheltered our family well - along with an assortment of stray cats and dogs, a few ferrets and an iguana. A family of flying squirrels is nesting under the eaves and a marauding raccoon occasionally enters through the dog door at night. As our daughter, Erin put it, "It's like living in a barn, only with more animals!" The idea of selling trees to loggers for $0.18 per board foot, then paying $0.70 per board foot for warped pine at a big-box store never did appeal to me. With my sawmill, any log that I bring in from the woods goes for its best use, depending on size and species. When the bed of our flatbed trailer needed replacing, I culled out some post oak trees, and milled them into full 2" thick decking that will probably outlast me. I have milled barn siding, fencing, and flooring for local farmers, and provided area wood workers with lumber that otherwise would be unavailable at any price. I even cut "urban lumber" from yard trees that have died or blown down. Some of these trees have sentimental value to the owners, and they just want to use the lumber to make furniture so that they have something from the tree that will endure. Unlike the more familiar circle mills, small band saw mills move the blade on a track through the log. The blade is well guarded, the engines range from 16 to 25 horsepower, and one or two people can easily operate them. My Norwood is a manual sawmill. Log handling (loading logs on the mill bed, turning the logs, clamping) and pushing the blade through the wood are all done with muscle. With the help of a hand winch, a good cant hook, and a little practice, it is much easier than you think. The 23-horsepower Briggs & Stratton engine automatically throttles down and the blade brake engages when not cutting wood. Besides the safety factor, this feature helps bring fuel consumption down to around four gallons for a good day's work, which typically yields around 1,200 board feet, if the logs are all arranged and ready to go. The mill's trailer option lets me easily tow the 1,800-pound machine behind my truck and set it up for cutting in about fifteen minutes. Norwood also offers track extensions for cutting long timbers. A friend of mine cuts 40' long posts and beams with one. Pulling just a 1/8" kerf, the band mills make less then half the sawdust of other types of sawmills, and I considerably get more lumber off a log than the charts predict. Let's do a little math to see how running a small mill comes out. This assumes you already have a chainsaw and tractor. The figures are based on one thousand board feet of cutting. Running a sawmill business requires close attention to the business side of things. I work strictly on a pay-as-I-go basis. No bank loans, no credit card debt. Initial investment in the mill is less than half the cost of a new pickup truck, though the closest thing I've got to that is an '87 Chevy flatbed. Other equipment includes a 1953 8N Ford tractor, a couple of chain saws, winch and a log arch for moving logs out of the woods. In other words, your cost is just over $.30 per board foot for quality lumber, compared to $.70 per board foot at the lumber yard. I set aside my best lumber to sell. Oak goes for $1.20 per board foot. Cherry and walnut go for $2.20 per board foot. A good day cutting oak can bring in a little over $1,000 in profit - and that's in addition to paying yourself $25 per hour. What started out as a practical way to cut lumber for my own projects has become a part-time business. The potential will only be realized if hard work is combined with good business sense - including marketing. While the mill was a great investment for me, it has taken time to make it profitable. Cutting railroad ties, for example, was steady, but marginal income. Small band mills are much better suited to custom cutting and the income is much better. Take time to visit area woodworkers. Look up all the area cabinet shops and let them know what you have to offer - and LISTEN to them when they tell you what they need. It might take you in an unexpected direction. Notices on bulletin boards at local farm supply stores, and even lumber yards will help people find you. Postings in the local advertiser and Craigslist can also help bring in customers. 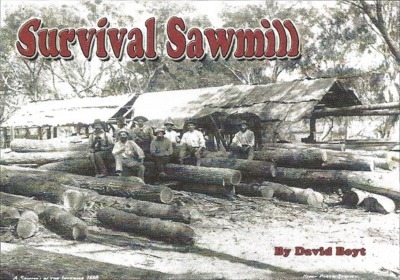 When looking for a first sawmill, consider how you will use it. Manual mills are relatively inexpensive and simple to operate, but require muscle power. They are often a good choice for a first mill, especially if you don't plan to use it every day. Hydraulic log handling reduces the effort, but the expense may not be justified unless you use the mill on a regular basic. If the mill can have hydraulics added to it as an option, it may save selling a manual mill to buy a hydraulic mill once the business picks up. Can the mill handle the size of timber you will be cutting? You might need to the option of adding track extensions for long logs. If you plan to move the mill check for the availability of a trailer package. This will open up your business to customers who do not have the equipment to bring their logs to you. The mill needs to be flexible enough to cut any log you put on it. One of the things that sold me on the Norwood is that it has a clamping system that can hold short, crooked logs and forks. It can also handle logs up to 34" diameter and can cut 28" wide boards with natural edges. Running the portable sawmill has given me many opportunities to meet a number of good people and provide them with a valued service and product. On a Veteran's day weekend a few years ago, I cut lumber for a local Korean war veteran. I never served in uniform myself, but I have the highest respect for those who did (and do). As we munched on the sandwiches he brought out for lunch, he talked about Korea. He lamented the fact that the Korean War, and those who had served in it had mostly been forgotten. I had to agree. When we settled up at the end of the day, I informed him that he qualified for my "Veteran's Day half-off veteran's discount". It about covered my expenses. Warm fuzzy feeling? Priceless. It reminded me of the commercial, "When did you last thank a veteran?" That day, a veteran thanked ME. I love being my own boss!